It was a gorgeous sunny morning, with blue skies. 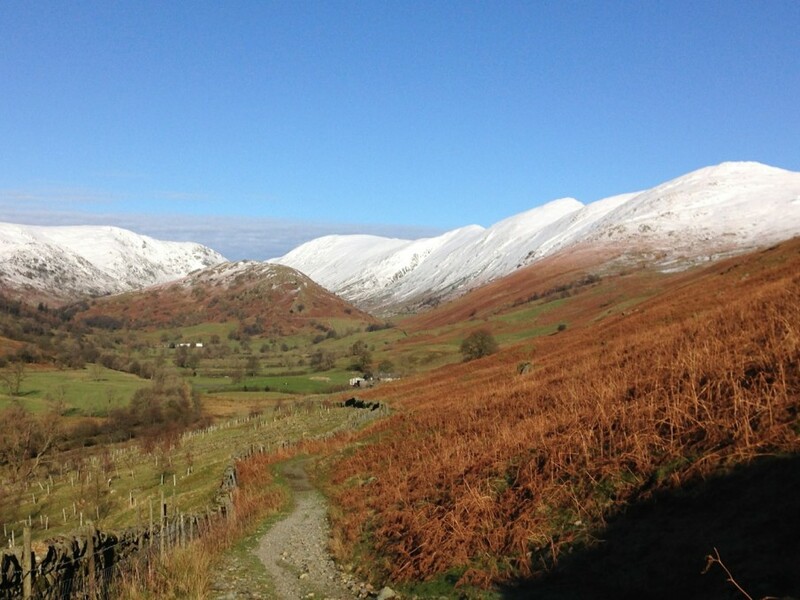 I started thinking about a Wainwright run for this afternoon, after work. I packed my running gear and left home for another adventure. 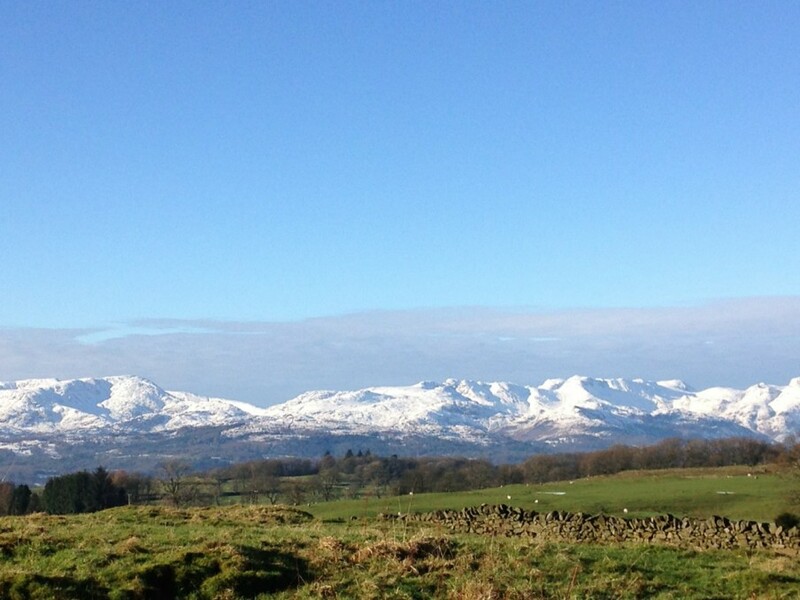 The distant fells were white, bright with snow. First stop, Staveley. I wanted to see what state the bridge was in by the Eagle & Child after December’s Storm Desmond. It’s in a sorry state. Completely knackered, with a big hole in one end and visibly collapsing in the middle. What’s surprising is that the river Gowan is a tributary of the Kent. It seemed inconceivable that the small stream today could have been the raging torrent that could wreck a bridge and spill over the walls flooding the nearby homes. I wondered why as I walked over the footbridge and into the More? Bakery in the Mill Yard, for an early lunch of haloumi, jalapeno, hummous and rocket ciabatta, with a flat white coffee. The bakery seemed quiet and there wasn’t a lot of stock on the shelves. Sitting on a stool by the big window, I watched a pied wagtail paddling in circles in a small puddle outside. After lunch, I drove to Troutbeck for the start of my run, parking next to the church. The first person I met was Phil Clarke. He’d just been for a run on Sallows and Sour Howes. “It’s magical up there”, he said, “but hard work. The snow’s hard on top, then collapses into dinner plates”. I had a short climb out of the valley floor, then a gradual descent along the bridleway going towards Troutbeck Tongue. There’s a lot of new tree planting either side of the trail, and I’d not been down this path before. As I got nearer to the Tongue, there were a few small land slides, and a farmer on a quad bike gathering his sheep from the fell with his dogs. 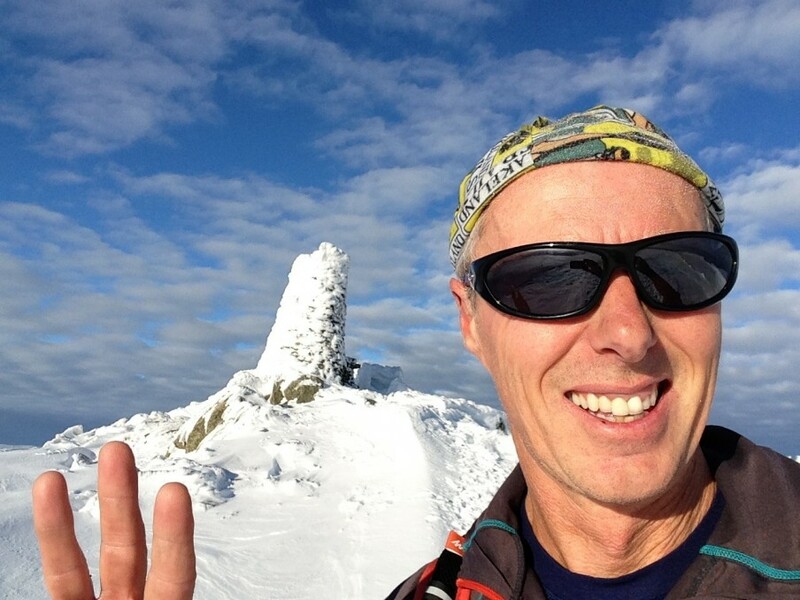 I enjoyed the scramble climb up the rocky spur, and made the summit in good time. There was soft snow along the path towards Thornthwaite Beacon, and this quickly became hard work on the climb itself out of the valley. Deep, “post holing” snow, where the sun had softened it. Harder in other places, so there was a mixture of easy steps, not so easy steps when the snow gave way, and really hard steps when my foot went down through the snow to my knee. It was fun, but slow work, and very, very tiring. 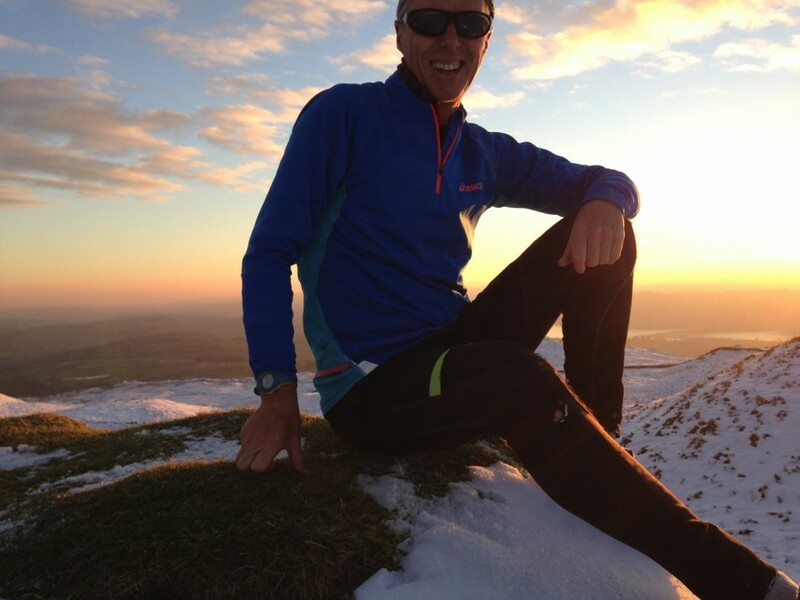 I thought back to last year and how these snowy runs really toughened me up during my Bob Graham training. 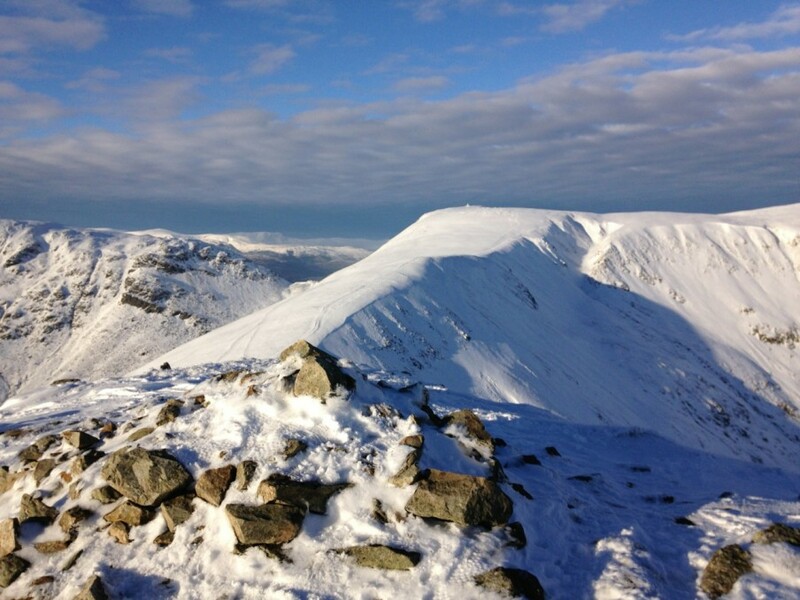 It took an age to get to Thornthwaite Crag. It was impossible to get any momentum going. I tried to run properly a few times. Once, my foot went down so far, I fell forward, then my arms disappeared into the snow too. I was lying flat, my face pressed against the cold snow and I could hardly push myself out! I decided at Thornthwaite Crag that it would make the most sense to return via Froswick rather than head on to Gray Crag (and High Street, then Mardale Ill Bell) as I’d originally planned. I was taking probably twice as long as I thought I’d be, just to get here. 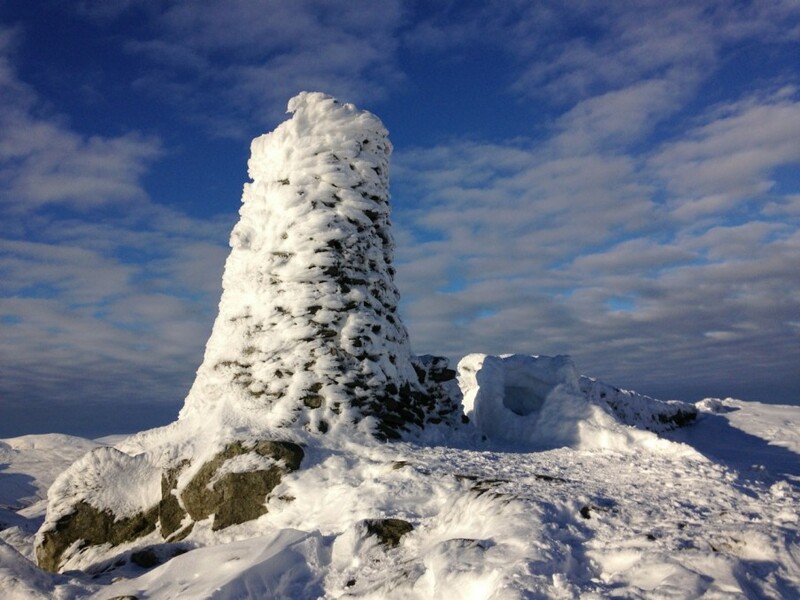 The huge cairn on the summit was a spectacular display of ice sculpture, and someone had built an igloo next to it for shelter. 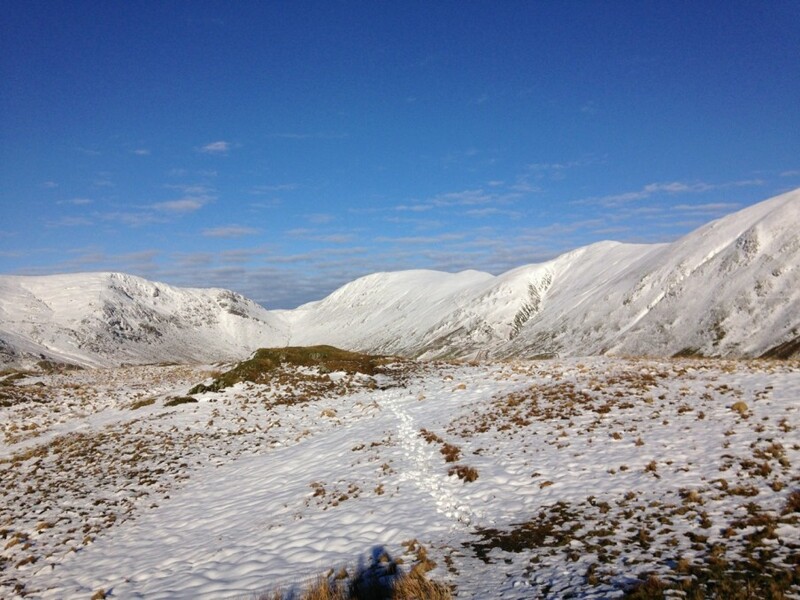 More fun and games on the way down towards Froswick, more face plants in the snow when I tried running too fast. It was easier going on the main path, where other people had compressed the snow. 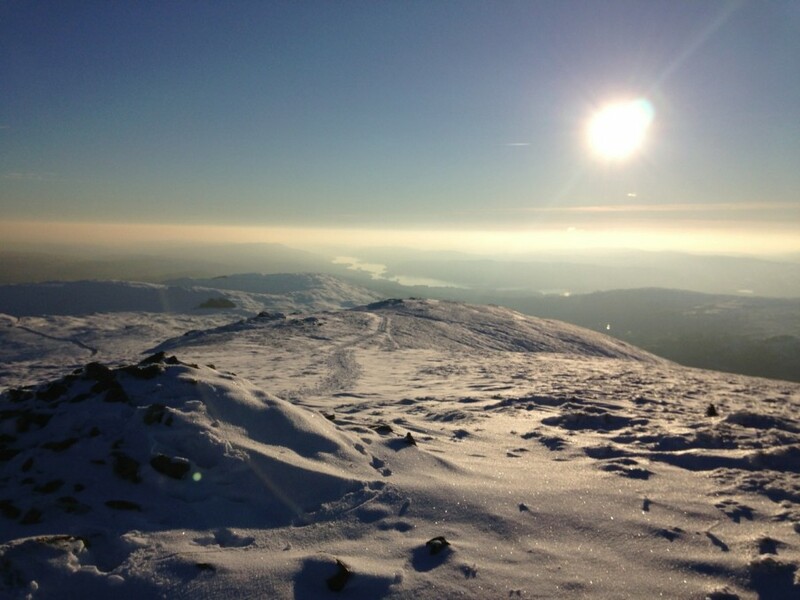 So I made good time to the summit at Froswick, and then Ill Bell and Yoke. The views all around were tremendous. 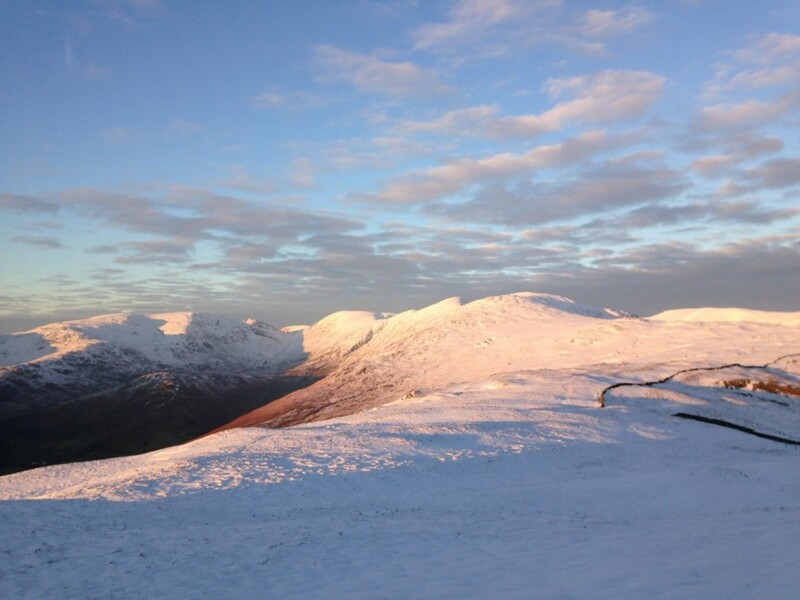 White, snowy summits. Blue sky, with clouds of every shade of grey, and shadows of each contour. My achilles were now getting sore. I was wearing Walsh PB’s with a number 3 written in magic marker on the heel tab. The last time I wore these shoes was on Leg 3 of my BG round in May last year! It probably wasn’t the best idea to try and run in them after so long in these conditions whilst still under the effects of jet lag with swollen ankles from the long haul flights. 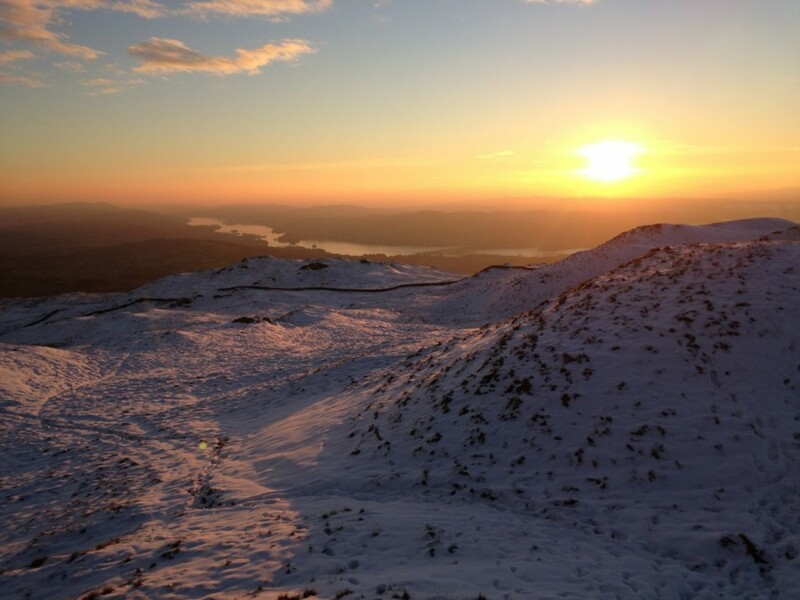 The sun was now sinking, with the light becoming even more wonderful, sparkling off the snow. It was very hard going on the ascent of Sallows from Garburn Pass, no-one else had been up here so I was making new steps in the deep snow, and I was really tired. By the time I reached Sour Howes, the skies turned into a spectacular red, orange and pink sunset. 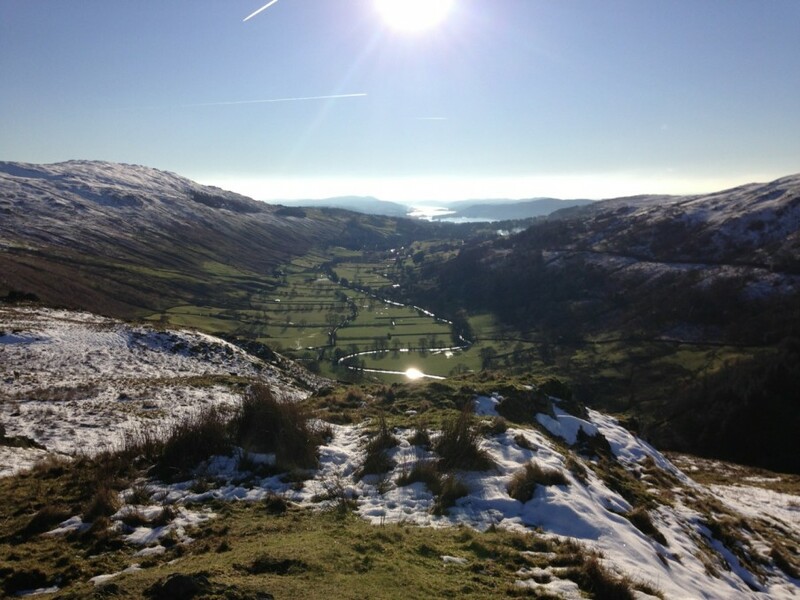 I jogged back down the lovely rocky ridge towards Troutbeck, satisfied with 7 more Wainwrights. That’s 8 down, 206 to go. 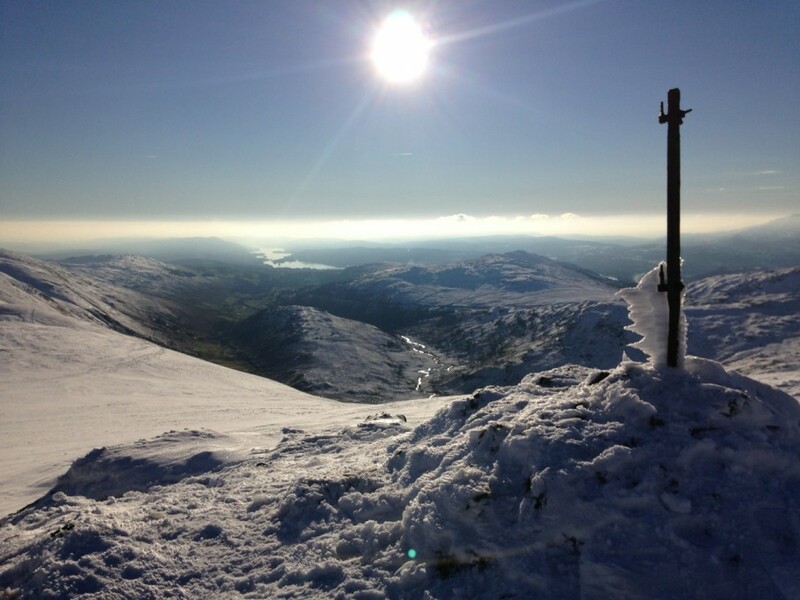 This entry was posted in Best Of, Blog and tagged bagging, Lake District, Lakeland Trails, run, running, summit, trail, trail running, Wainwright. Bookmark the permalink.